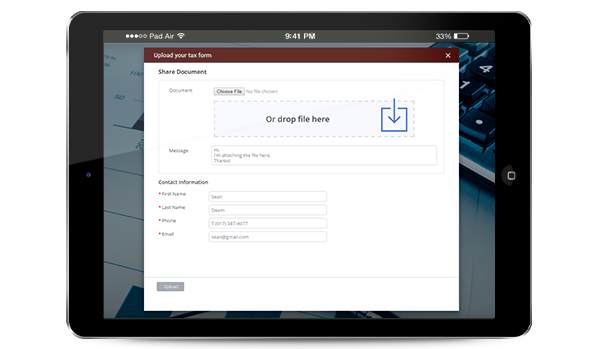 Securely share documents with clients online, upload & save documents for quick sharing, and let clients share files with you from any device. Sharing files and documents with your clients is easy with vCita Online File Sharing. Instead of emailing files, small businesses can upload files to vCita LiveSite. Clients are notified via email or on their next visit to your website. A client portal allows clients to view the shared documents on any device, anywhere, and also upload files online and share documents with you. Shared files are available for your review via vCita along with the relevant client correspondence history. 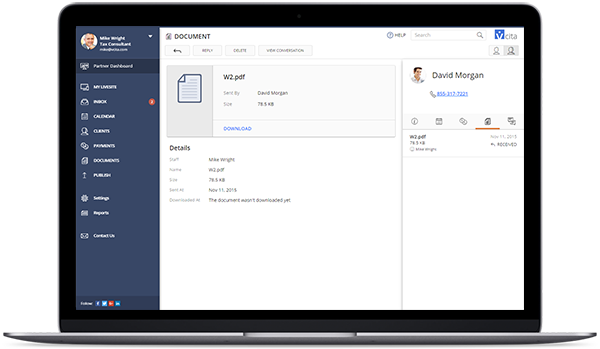 Document sharing with vCita makes it easy to track when a shared document is viewed or when a new file is available. Share files as part of your conversation with existing clients. Ask clients to upload and share a document as part of their service request. The client and appropriate team member are both notified of newly shared documents and can download them with a click. Shared documents are available via LiveSite client portal on your website. Clients are recognized and after verification, may view shared documents or share a file with you. Track files as part of the client’s account in vCita Contact Management Software. Shared documents will be available to the relevant staff member working with the client.